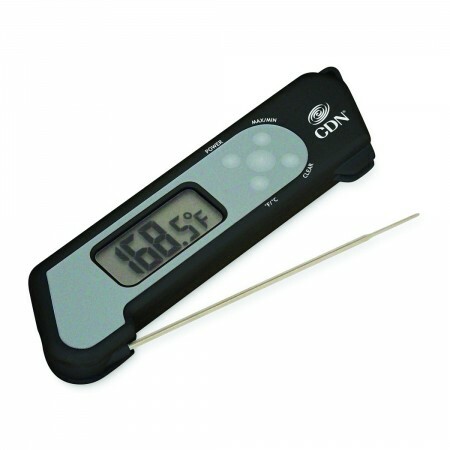 The CDN TCT572-BK ProAccurate® Folding Thermocouple Thermometer Black provides quick temperature readings so chefs can tell when foods have finished cooking. A useful addition to any commercial kitchen, this thermometer accurately measures temperature within 3-6 seconds and has a temperature capacity of -58 degrees to 572 degrees Fahrenheit. Thanks to its thin stainless steel probe, this thermometer easily slides into meat while its extra-big digital display provides clear readings. For added convenience, the probe can be folded into its ABS plastic case for easy storage.